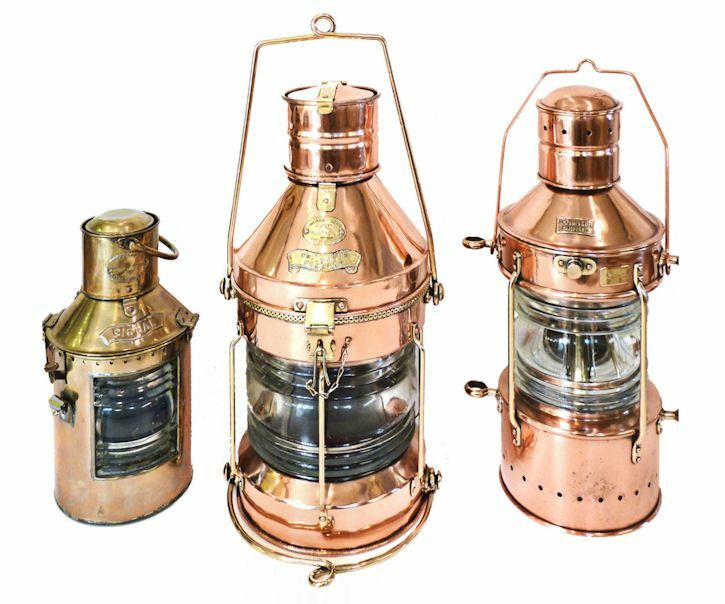 To view our current inventory of exceptional antique navigation lights, click here! This Great Old Navigation Lamp Has Been Sold. Thank you! A Very Rare Navigation Light from a Large Ship! DIMENSIONS: Lamp not counting bails, 22" high Overall height 28" Diameter of 10”. PRESENTED is the largest antique kerosene ships navigation light we've ever discovered. The maker's tag on the front is imprinted W. Doxford & Sons Ltd, Sunderland, England and carries the serial number Q 443. It was intended for use when a ship was "Not Under Command" as stated in the tag immediately beneath it. Not Under Command generally meant that the vessel was restricted in her ability to maneuver, aground or without propulsion. The red all around filter that was used is removable so that the lamp will show a white light, and therefore may be used as an anchor light. The shape of this lamp allowed it to be used as a distress signal with the red lens installed or as an anchor light when it was removed. An internal hurricane chimney was not necessary. Note the large bail or stirrup at the bottom of the lamp which helped guide it when it was raised or lowered. Fueling would last for about eight days. BRIEF HISTORY OF THE MAKER: Doxford's was an English shipbuilder which started operations in 1840 in the Pallion area of Sunderland, located in the North of England, and in Scotland. Sunderland became the largest shipbuilding town in the world - a distinction it held for more than 130 years, and William Doxford's grew along with it. The yard was most noted for their Tramp Steamer design which served in two Wars and the 178 Turret Deck ships they built from 1893 to 1914 that were designed to reduce the charges for passing through the Suez Canal. They had a very narrow deck and their beam increased at the waterline down which allowed them to carry a large cargo and beat the measurement rule. Shown is a Doxford turret ship of that period. During both World Wars, they made ships for the War Department, i.e. 20 destroyers and Ministry of Shipping, many freighters. After WW II they were acquired by J.L. Thomson & Sons another Sunderland builder which ceased operations in 1961. 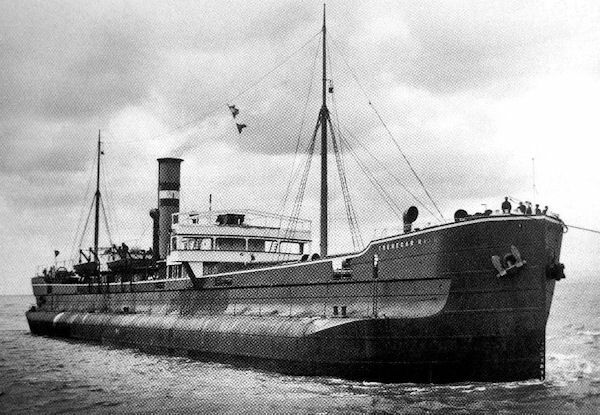 The SS Tredegar shown above is a typical Doxford built Turret Deck ship. This lamp would date to an earlier period and is the largest navigation light that we have seen of this type. Old fashioned Turn of 20th Century styling. CONDITION: This lamp is in excellent condition with only the usual minor marks of age from use at sea. The Fresnel lens is perfect. The kerosene burner is original. The knurled knobs are stamped "Best British Make" on three lines. The knob on the left is bent and wiggles. No hurricane glass is fitted. OUR UNCONDITIONAL NO NONSENSE GUARANTEE: If not completely satisfied with your purchase it may be returned within five days of receipt in its original packaging if without damage. Return items must be insured for their full value. Only a prior email from us authorizing the return is required. Shipping charges are included in within the continental United States if the error is due to our fault. This lamp is very rare and should appeal to a discriminating collector who is looking for something exceptional.